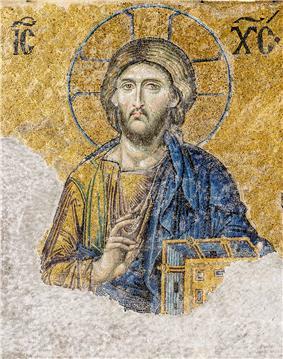 The most famous of the surviving Byzantine mosaics of the Hagia Sophia in Constantinople – the image of Christ Pantocrator on the walls of the upper southern gallery. 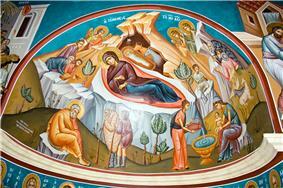 Christ is flanked by the Virgin Mary and John the Baptist. 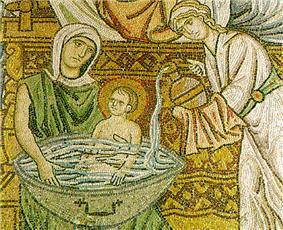 The mosaics were made in the 12th century. Byzantine art is the name for the artistic products of the Eastern Roman (Byzantine) Empire, as well as the nations and states that inherited culturally from the empire. Though the empire itself emerged from Rome's decline and lasted until the Fall of Constantinople in 1453, many Eastern Orthodox states in Eastern Europe, as well as to some degree the Muslim states of the eastern Mediterranean, preserved many aspects of the empire's culture and art for centuries afterward. A number of states contemporary with the Byzantine Empire were culturally influenced by it, without actually being part of it (the "Byzantine commonwealth"). These included Bulgaria, Serbia, and the Rus, as well as some non-Orthodox states like the Republic of Venice and the Kingdom of Sicily, which had close ties to the Byzantine Empire despite being in other respects part of western European culture. Art produced by Eastern Orthodox Christians living in the Ottoman Empire is often called "post-Byzantine." Certain artistic traditions that originated in the Byzantine Empire, particularly in regard to icon painting and church architecture, are maintained in Greece, Serbia, Bulgaria, Macedonia, Russia and other Eastern Orthodox countries to the present day. Just as the Byzantine Empire represented the political continuation of the Roman Empire, Byzantine art developed out of the art of the Roman Empire, which was itself profoundly influenced by ancient Greek art. 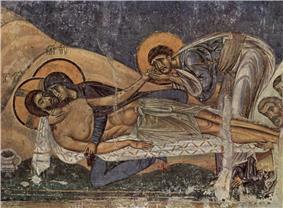 Byzantine art never lost sight of this classical heritage. The Byzantine capital, Constantinople, was adorned with a large number of classical sculptures, although they eventually became an object of some puzzlement for its inhabitants. And indeed, the art produced during the Byzantine Empire, although marked by periodic revivals of a classical aesthetic, was above all marked by the development of a new aesthetic. The most salient feature of this new aesthetic was its “abstract,” or anti-naturalistic character. If classical art was marked by the attempt to create representations that mimicked reality as closely as possible, Byzantine art seems to have abandoned this attempt in favor of a more symbolic approach. 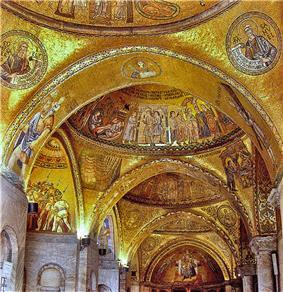 The subject matter of monumental Byzantine art was primarily religious and imperial: the two themes are often combined, as in the portraits of later Byzantine emperors that decorated the interior of the sixth-century church of Hagia Sophia in Constantinople. These preoccupations are partly a result of the pious and autocratic nature of Byzantine society, and partly a result of its economic structure: the wealth of the empire was concentrated in the hands of the church and the imperial office, which therefore had the greatest opportunity to undertake monumental artistic commissions. Religious art was not, however, limited to the monumental decoration of church interiors. One of the most important genres of Byzantine art was the icon, an image of Christ, the Virgin, or a saint, used as an object of veneration in Orthodox churches and private homes alike. Icons were more religious than aesthetic in nature: especially after the end of iconoclasm, they were understood to manifest the unique “presence” of the figure depicted by means of a “likeness” to that figure maintained through carefully maintained canons of representation. The so-called “minor arts” were very important in Byzantine art and luxury items, including ivories carved in relief as formal presentation Consular diptychs or caskets such as the Veroli casket, hardstone carvings, enamels, jewelry, metalwork, and figured silks were produced in large quantities throughout the Byzantine era. Many of these were religious in nature, although a large number of objects with secular or non-representational decoration were produced: for example, ivories representing themes from classical mythology. Byzantine ceramics were relatively crude, as pottery was never used at the tables of the rich, who ate off silver. Leaf from an ivory diptych of Areobindus Dagalaiphus Areobindus, consul in Constantinople, 506. Areobindus is shown above, presiding over the games in the Hippodrome, depicted beneath. 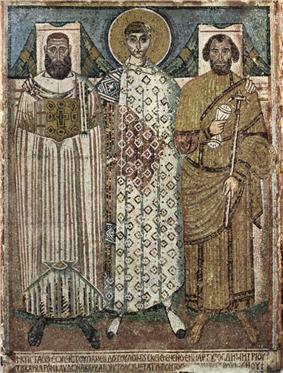 Byzantine art and architecture is divided into four periods by convention: the Early period, commencing with the Edict of Milan (when Christian worship was legitimized) and the transfer of the imperial seat to Constantinople, extends to 842 AD, with the conclusion of Iconoclasm; the Middle, or high period, begins with the restoration of the icons in 843 and culminates in the Fall of Constantinople to the Crusaders in 1204; the Late period includes the eclectic osmosis between Western European and traditional Byzantine elements in art and architecture, and ends with the Fall of Constantinople to the Ottoman Turks in 1453. The term post-Byzantine is then used for later years, whereas Neo-Byzantine is used for art and architecture from the 19th century onwards, when the dissolution of the Ottoman Empire prompted a renewed appreciation of Byzantium by artists and historians alike. The next major building campaign in Constantinople was sponsored by Theodosius I. The most important surviving monument of this period is the obelisk and base erected by Theodosius in the Hippodrome. which, with the large silver dish called the Missorium of Theodosius I, represent the classic examples of what is sometimes called the "Theodosian Renaissance". The earliest surviving church in Constantinople is the Basilica of St. John at the Stoudios Monastery, built in the fifth century. A significant component of Justinian's project of imperial renovation was a massive building program, which was described in a book, the Buildings, written by Justinian's court historian, Procopius. Justinian renovated, rebuilt, or founded anew countless churches within Constantinople, including Hagia Sophia, which had been destroyed during the Nika riots, the Church of the Holy Apostles, and the Church of Saints Sergius and Bacchus. Justinian also built a number of churches and fortifications outside of the imperial capital, including Saint Catherine's Monastery on Mount Sinai in Egypt, and the Basilica of St. John in Ephesus. Important works of luxury art from this period include the silver David Plates, produced during the reign of Heraclius, and depicting scenes from the life of the Hebrew king David. The most notable surviving manuscripts are Syriac gospel books, such as the so-called Syriac Bible of Paris. However, the London Canon Tables bear witness to the continuing production of lavish gospel books in Greek. 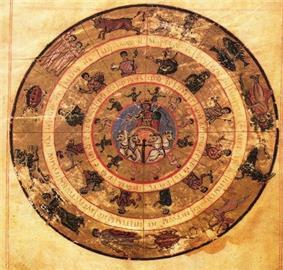 Helios in his chariot, surrounded by symbols of the months and of the zodiac. From Vat. Gr. 1291, the "Handy Tables" of Ptolemy, produced during the reign of Constantine V.
In the 9th and 10th centuries the Empire's military situation improved, and patronage of art and architecture increased. New churches were commissioned, and the standard architectural form (the "cross-in-square") and decorative scheme of the Middle Byzantine church were standardised. Major surviving examples include Hosios Loukas in Boeotia, the Daphni Monastery near Athens and Nea Moni on Chios. 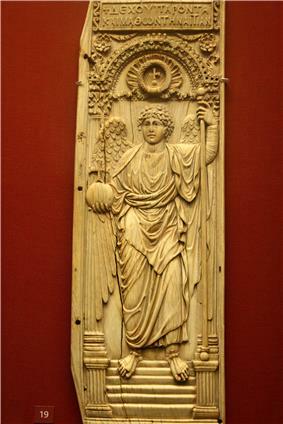 The Macedonian period also saw a revival of the late antique technique of ivory carving. Many ornate ivory triptychs and diptychs survive, such as the Harbaville Triptych and a triptych at Luton Hoo, dating from the reign of Nicephorus Phocas). The Macedonian emperors were followed by the Komnenian dynasty, beginning with the reign of Alexios I Komnenos in 1081. Byzantium had recently suffered a period of severe dislocation following the battle of Manzikert in 1071 and the subsequent loss of Asia Minor to the Turks. However, the Komnenoi brought stability to the empire, (1081–1185), and during the course of the twelfth century their energetic campaigning did much to restore the fortunes of the empire. The Komnenoi were great patrons of the arts, and with their support Byzantine artists continued to move in the direction of greater humanism and emotion, of which the Theotokos of Vladimir, the cycle of mosaics at Daphni, and the murals at Nerezi yield important examples. Ivory sculpture and other expensive mediums of art gradually gave way to frescoes and icons, which for the first time gained widespread popularity across the Empire. 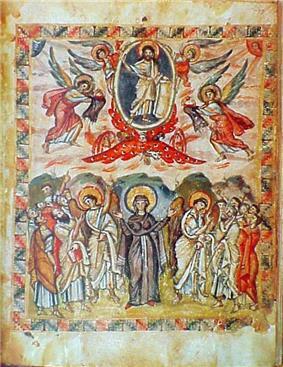 Apart from painted icons, there were other varieties - notably the mosaic and ceramic ones. Twenty-two hundred years of continuous Roman tradition and sixteen hundred years of Hellenistic civilization were brought to an abrupt end in 1204 with the sacking of Constantinople by the Venetian and French knights of the Fourth Crusade, a disaster from which the Empire never recovered. Steven Runciman, greatest of 20th century crusade historians, would write in 1954: "There was never a greater crime against humanity than the Fourth Crusade." The destruction by sack or subsequent neglect of the city's secular architecture in particular has left us with an imperfect understanding of Byzantine art. Byzantine Crete had been seized from the collapsed empire in 1211 by Venice, and Byzantine artistic traditions continued long after the Ottoman conquest of the last Byzantine successor state in 1461. The Cretan school, as it is today known, gradually introduced Western elements into its style, and exported large numbers of icons to the West. The tradition's most famous artist was El Greco. In particular, teams of mosaic artists were despatched as diplomatic gestures by emperors to Italy, where they often trained locals to continue their work in a style heavily influenced by Byzantium. Venice and Norman Sicily were particular centres of Byzantine influence. The earliest surviving panel paintings in the West were in a style heavily influenced by contemporary Byzantine icons, until a distinctive Western style began to develop in Italy in the Trecento; the traditional and still influential narrative of Vasari and others has the story of Western painting begin as a breakaway by Cimabue and then Giotto from the shackles of the Byzantine tradition. In general Byzantine artistic influence on Europe was in steep decline by the 14th century if not earlier, despite the continued importance of migrated Byzantine scholars in the Renaissance in other areas. Russian icon painting began by entirely adopting and imitating Byzantine art, as did the art of other Orthodox nations, and has remained extremely conservative in iconography, although its painting style has developed distinct characteristics, including influences from post-Renaissance Western art. All the Eastern Orthodox churches have retained highly protective of their traditions in terms of the form and content of images and, for example, modern Orthodox depictions of the Nativity of Christ vary little in content from those developed in the 6th century. ^ See Kitzinger, Ernst, Byzantine art in the making: main lines of stylistic development in Mediterranean art, 3rd-7th century, pp 1-3, 1977, Faber & Faber, ISBN 0571111548 (US: Cambridge UP, 1977). The start date of the Byzantine period is rather clearer in art history than in political history, if still imprecise. ^ C. Mango, "Antique statuary and the Byzantine beholder," Dumbarton Oaks Papers 17 (1963), 53-75. ^ O. Brendel, Prolegomena to the study of Roman art (New Haven, 1979). ^ B. Berenson, The Arch of Constantine; or, the decline of form (London, 1954). ^ J. Elsner, "The birth of late antiquity: Riegl and Strzygowski in 1901," Art History 25 (2002), 358-79. ^ E. Kitzinger, Byzantine art in the making (Cambridge, 1977). ^ J. Onians, "Abstraction and imagination in late antiquity," Art History 3 (1980), 1-23. ^ C. Mango, "Antique statuary," 65. ^ H. Belting, tr. E. Jephcott, Likeness and presence: a history of the image before the era of art (Chicago, 1994). ^ G. Fowden, "Constantine's porphyry column: the earliest literary allusion," Journal of Roman Studies 81 (1991), 119-31; F.A. Bauer, Stadt, Platz und Denkmal (Mainz, 1996). ^ T. Mathews, The early churches of Constantinople: architecture and liturgy (University Park, 1971); N. Henck, "Constantius ho Philoktistes?," Dumbarton Oaks Papers 55 (2001), 279-304 (available online). ^ R. Krautheimer, Rome: profile of a city (Princeton, 2000). ^ J.-M. Spieser, Thessalonique et ses monuments du IVe au VIe siècle (Athens, 1984); S. Ćurčić, Some observations and questions regarding early Christian architecture in Thessaloniki (Thessaloniki, 2000). ^ D.H. Wright, The Vatican Vergil (Berkeley, 1993). ^ D.H. Wright, The Roman Vergil and the origins of medieval book design (Toronto, 2001). ^ I. Levin, The Quedlinburg Itala (Leiden, 1985). ^ R. Delbrueck, Die Consulardiptychen und verwandte Denkmäler (Berlin, 1929). ^ E.C. Dodd, Byzantine silver stamps (Washington, 1961). ^ M. Almagro-Gorbea, ed., El disco de Teodosio (Madrid, 2000). ^ M. Maas, ed., The Cambridge companion to the age of Justinian (Cambridge, 2005). ^ Tr. H.B. Dewing, Procopius VII (Cambridge, 1962). English text online. ^ R.J. Mainstone, Hagia Sophia: architecture, structure, and liturgy of Justinian's great church (New York, 1997). ^ K. Dark and F. Özgümüş, "New evidence for the Byzantine Church of the Holy Apostles from Fatih Camii, Istanbul," Oxford Journal of Archaeology 21 (2002), 393-413. ^ J. Bardill, "The Church of Sts. Sergius and Bacchus in Constantinople and the monophysite refugees," Dumbarton Oaks Papers 54 (2000), 1-11; T. Mathews, "The palace church of Sts. Sergius and Bacchus in Constantinople," in J.J. Emerick and D.M. Delliyannis, eds., Archaeology in architecture: studies in honor of Cecil L. Striker (Mainz, 2005). ^ G.H. Forsyth and K. Weitzmann, The monastery of St. Catherine at Mount Sinai: the church and fortress of Justinian (Ann Arbor, 1973). ^ A. Thiel, Die Johanneskirche in Ephesos (Wiesbaden, 2005). ^ F.W. Deichmann, Ravenna: Hauptstadt des spätantiken Abendlandes (Wiesbaden, 1969). ^ Website of the Eufrasiana Basilica project. ^ E. Wellesz, The Vienna Genesis (London, 1960). ^ G. Cavallo, Codex purpureus Rossanensis (Rome, 1992). ^ A. Grabar, Les peintures de l'évangéliaire de Sinope (Bibliothèque nationale, Suppl. gr. 1286) (Paris, 1948). ^ O. Mazal, Der Wiener Dioskurides: Codex medicus Graecus 1 der Österreichischen Nationalbibliothek (Graz, 1998). ^ A. Cutler, "Barberiniana: notes on the making, content, and provenance of Louvre OA. 9063," in Tesserae : Festschrift für Josef Engemann, Jahrbuch für Antike und Christentum, Ergänzungsband 18 (1993) 329-339. ^ D. Wright, "Justinian and an archangel," Studien zur spätantiken Kunst Friedrich Wilhelm Deichmann gewidmet, (Mainz 1986), III.75-79. ^ J. Haldon, Byzantium in the seventh century: the transformation of a culture (Cambridge, 1997). ^ L. Brubaker, "Elites and patronage in early Byzantium: the evidence from Hagios Demetrios in Thessalonike," in J. Haldon et al., eds., The Byzantine and early Islamic Near East: elites old and new (Princeton, 2004), 63-90. ^ C. Barber, “The Koimesis Church, Nicaea: the limits of representation on the eve of iconoclasm,” Jahrbuch der österreichischen Byzantinistik 41 (1991), 43-60. ^ G. Matthiae, Pittura romana del medioevo (Rome, 1987). ^ K.A.C. Creswell, Early Muslim architecture (New York, 1979); F.B. Flood, The Great Mosque of Damascus: studies on the making of an Umayyad visual culture (Leiden, 2001). ^ R. Leader, "The David Plates revisited: transforming the secular in early Byzantium," Art Bulletin 82 (2000), 407-27 (available online). ^ J. Leroy, Les manuscrits syriaques à peintures conservés dans les bibliothèques d'Europe et d'Orient; contribution à l'étude de l'iconographie des Églises de langue syriaque (Paris, 1964). ^ C. Nordenfalk, Die spätantiken Kanontafeln (Göteborg, 1938). ^ L. Brubaker, "Icons before iconoclasm?," Morfologie sociali e culturali in europa fra tarda antichita e alto medioevo, Settimane di Studio del Centro Italiano di Studi sull’ Alto Medioevo 45 (1998), 1215-54. ^ A. Bryer and J. Herrin, eds., Iconoclasm (Birmingham, 1977); L. Brubaker and J. Haldon, Byzantium in the iconoclast era (ca. 680-850): the sources (Birmingham, 2001). ^ D. Stein, Der Beginn des byzantinischen Bilderstreites und seine Entwicklung bis in die 40er Jahre des 8. Jahrhunderts (Munich, 1980). The story of the Chalke Icon may be a later invention: M.-F. Auzépy, “La destruction de l’icône du Christ de la Chalcé par Léon III : propagande ou réalité? ", Byzantion 60 (1990), 445-492. ^ A. Grabar, L’iconoclasme byzantin: le dossier archéologique, 2nd ed., (Paris, 1984). ^ D. Wright, “The date of the Vatican illuminated handy tables of Ptolemy and of its early additions,” Byzantinische Zeitschrift 78 (1985). ^ R. Cormack, “The arts during the age of iconoclasm,” in A. Bryer and J. Herrin, eds., Iconoclasm (Birmingham, 1977). ^ U. Peschlow, Die Irenenkirche in Istanbul (Tübingen, 1977). ^ K. Theocharidou, The architecture of Hagia Sophia, Thessaloniki, from its erection up to the Turkish Conquest (Oxford, 1988). R. Cormack, Byzantine art (Oxford, 2000). Evans, Helen C. & Wixom, William D (1997). The Glory of Byzantium: Art and Culture of the Middle Byzantine Era, A.D. 843-1261. New York: The Metropolitan Museum of Art. C. Mango, ed., The art of the Byzantine Empire, 312-1453: sources and documents (Englewood Cliffs, 1972). James, Elizabeth. Art and Text in Byzantine Culture (1 ed.). Cambridge University Press. Anthony Cutler on the economic history of Byzantine mosaics, wall-paintings and icons; at Dumbarton Oaks.